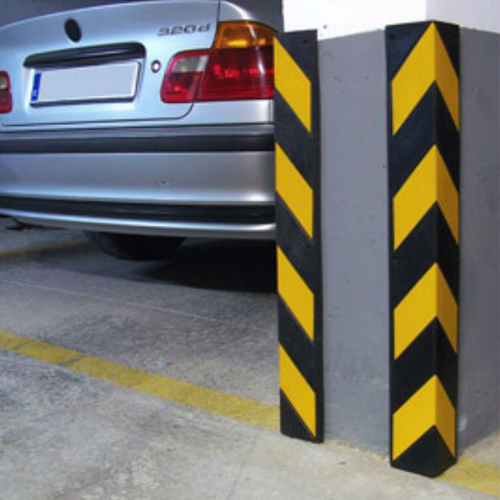 We manufacture the best product to protect the columns in the parking lots of bumps and bruises caused by low speed vehicles, the Column Protectors are the best option to avoid high maintenance costs as they avoid damage to both columns and vehicles. The column protectors most well-known product as Rubber Corner Guards have integrated reflective tape that gives them excellent visibility in places and times with low light as they reflect very well the light coming from cars and other sources of lighting. The installation of the column protectors is also very simple thanks to its low weight and prefabricated holes that help to a quick installation with the screws made to measure for an excellent installation without risk of the protectors loosen or fall by the use. If you want to know our column protectors or any other of our products, contact our Sales Department and schedule a visit with one of our Representatives who will be able to show you the products and advise you on any questions you may have. Heavy-Duty Corner guard regular and heavy duty are made of rubber making these products long lasting and very durable. Our Corner Guards help provide high impact resistance for enhanced structural integrity in high-traffic areas. Molded reflective tape improves driver visibility for safety and security. Very easy to maintain and very resistant to chemical, weather and corrosion. Great for Indoor and Outdoor. Available in Heavy Duty molded type.